Beech Mountain is the prominent peak located between Long Pond and Echo Lake that has several tall ridgelines and cliffs descending to the east. 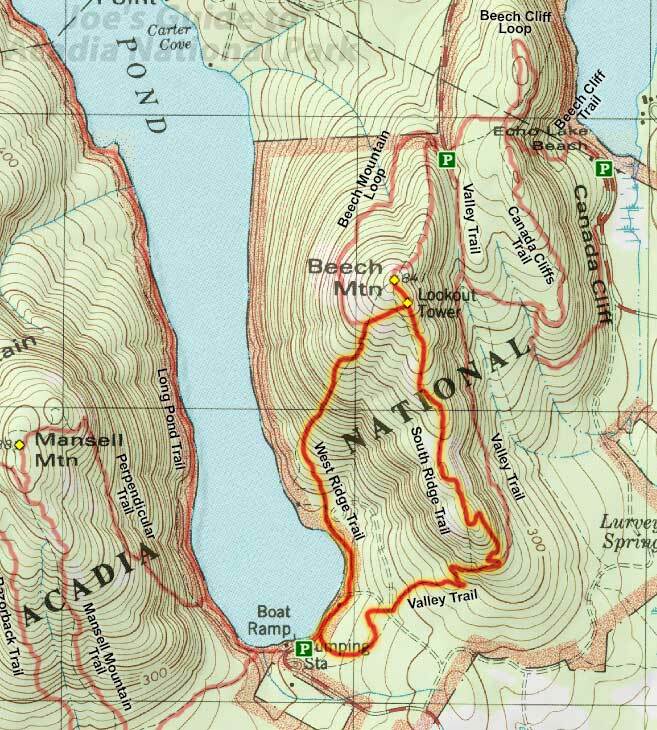 In this section of Acadia National Park is a fairly complex network of trails that wander through the Beech Cliffs, the Canada Cliffs, and also head to the summit of Beech Mountain proper. 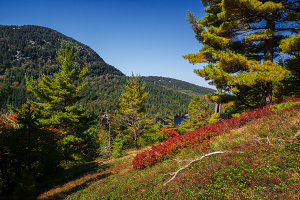 The West Ridge Trail is an interesting loop hike option that starts on the southern shore of Long Pond (the same starting point as the Perpendicular Trail) and heads up the southwestern side of Beech Mountain to top out at one of Acadia's famous landmarks, the Beech Mountain fire tower. Length: 2.2 miles total for loop hike. Elevation Change: 750-ft elevation gain to summit of Beech Mountain. Look for the West Ridge Trailhead on the east side of the parking area and follow the pleasant lakeside trail as it heads northeast around the pond. Note that there are a few private cottages and insets of land along this section of the pond, so please respect all private property signs. Soon enough, the trail leaves the water and starts its steady ascent up the west face of Beech Mountain. As you get higher and higher, be sure to look behind you every now and then to catch the great views of Mansell Mountain on the other side of Long Pond. Near the top of the mountain, you will reach the junction with the Beech Mountain Trail (Beech Mountain Loop); be sure to take the spur that heads to the Beech Mountain summit. Within moments, you will be standing at the summit under the majestic old Beech Mountain fire tower. While the fire tower is typically closed so you can't climb to the very top, you can walk up the first set of steps to get a great view in all directions. 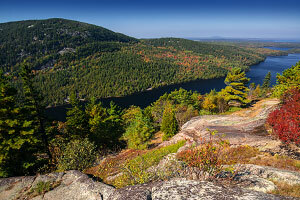 When looking to the northeast, you can even see Acadia Mountain and the majestic Sargent Mountain far in the distance. For the return hike, while you could just take the West Ridge Trail back down, you can also do a fun loop hike by taking the South Ridge Trail back down. The South Ridge Trail also offers good views of Long Pond and roughly 15 minutes down from the fire tower, there is a good off-trail viewpoint at the edge of a tall cliff. This area is occasionally used by climbers as there a few bolts placed near the edge. Continuing down the mountain, the South Ridge Trail intersects with the Valley Trail; turn right and take the Valley Trail west back to the Long Pond parking area. While there might not be anything overly stunning about this hike or the views along this hike, this is definitely a fun and refreshing loop hike through some typically sublime Acadia scenery. The fire tower on top of Beech Mountain also makes for a fun landmark destination.